By Craig | October 19, 2018 | This post may contain affiliate links, which means we may receive a small commission, at no cost to you, if you make a purchase through a link. Read our Disclosure. 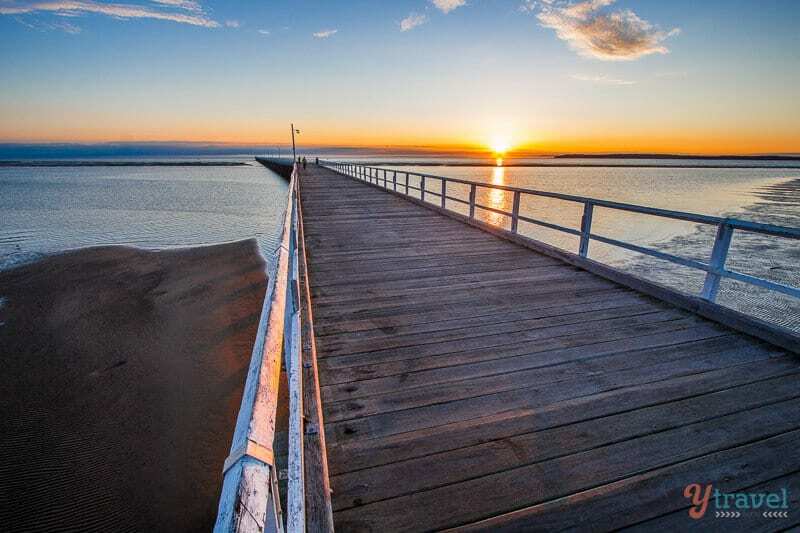 Waking up to a stunning sunrise over the Urangan jetty set the stage for our Whale watching Hervey Bay tour. 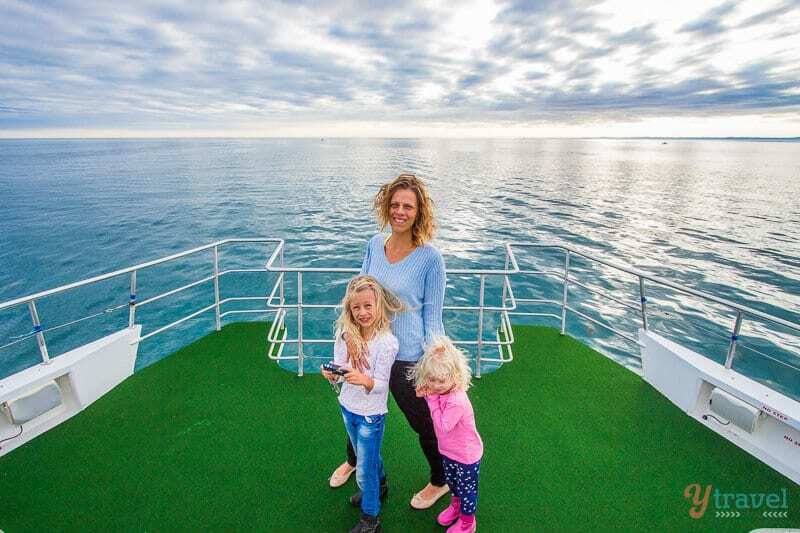 We were in Hervey Bay, Queensland along the Fraser Coast, a spot well known as the whale watching capital of Australia, on a family adventure to spot humpback whales. 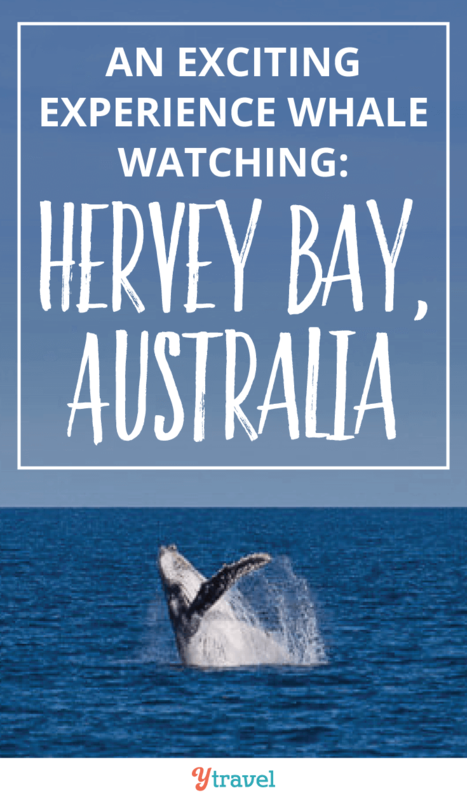 The Hervey Bay whale watching season runs pretty much the same as the rest of Australia, from June to October as thousands of whales migrate up and down the east coast of Australia and the protected calm waters of Hervey Bay is a favourite transit stop for them as they rest and play. 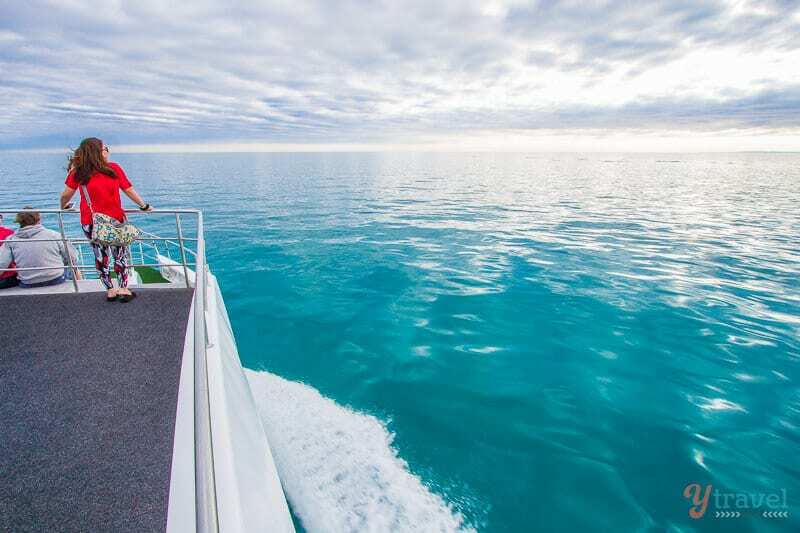 We jumped on the early morning whale watching tour with the folks from Hervey Bay Whale Watch and their boat Quick Cat II. And we were in good hands, owners Brian and Jill Perry are the pioneers having started the industry back in 1987. It wasn’t long before our kids got their first treat for the day. Hot chocolate and pancakes were on offer and every child on board receives a Children’s Activity Booklet. Winning so far! Caz and I enjoyed our coffee and a light breakfast as we cruised towards the open bay, enjoying the fresh air and the serenity of the girls sitting still for fifteen minutes. Kalyra loves to learn about wildlife and the world around her and within no time had read through her whale booklet whilst little miss Savannah was enjoying her games, puzzles, and pictures. Captain Brian increased the speed as we headed towards the open bay with the sun starting to poke its head through the breaking clouds. His crew were providing commentary and tips on photography and the morning was getting better by the minute. 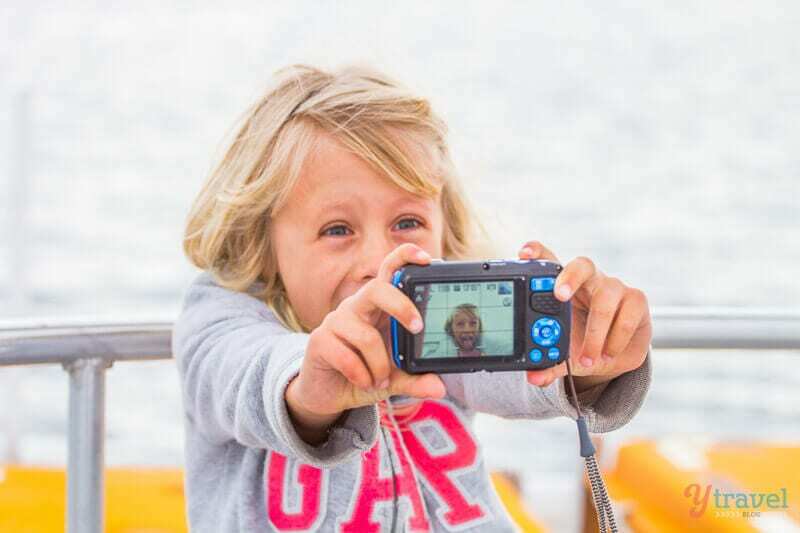 The only other time we’d been whale watching was in the open ocean and trying to take a photo in the choppy and windy conditions was like stumbling around trying to pin the tail on the donkey blind folded. 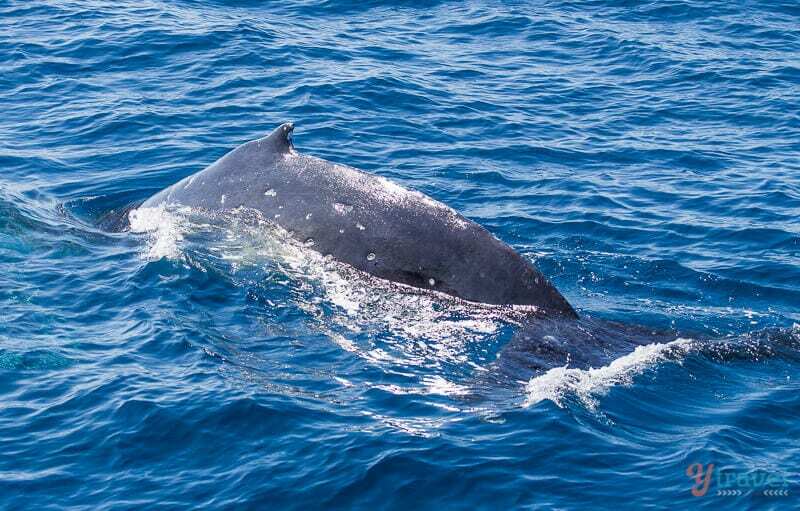 I could already tell why the whales enjoyed spending up to 10 days on their migration in Hervey Bay using the time to socialise and rest. 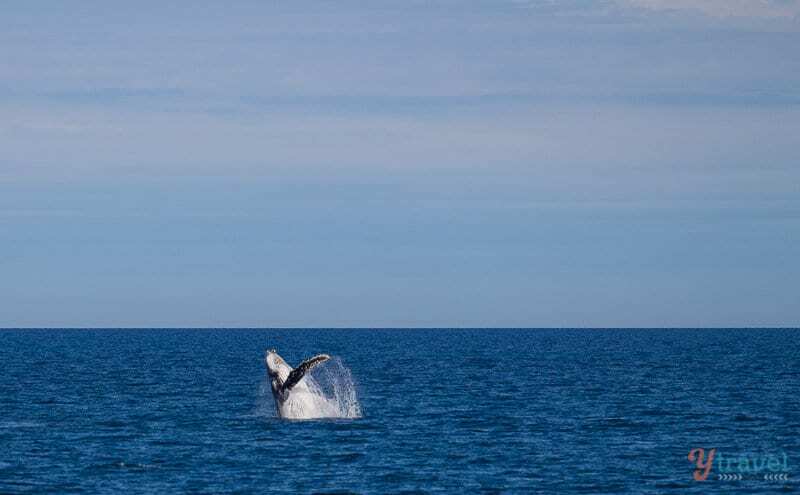 Spotting whales is one of the top things to do in Hervey Bay and 20 years of research has confirmed that the Fraser Coast is the only genuine stopover along the migration route where up to 10,000 whales deviate from their annual journey back to Antarctica. 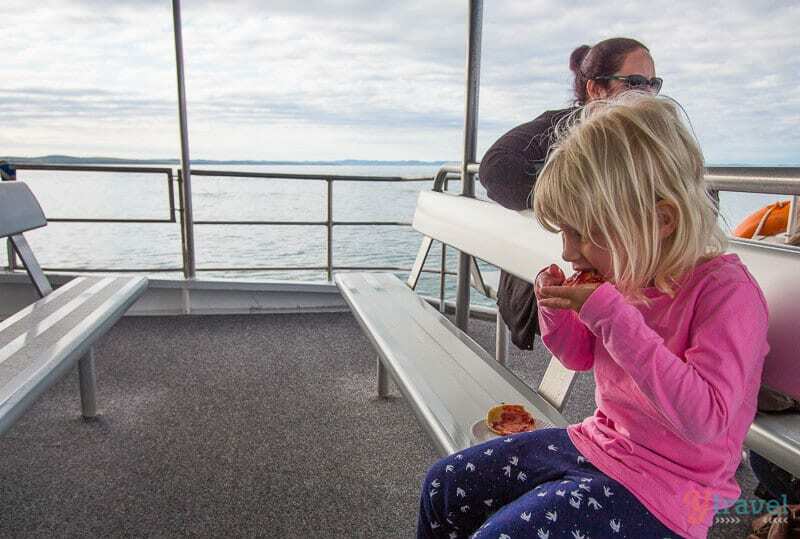 Unfortunately, our Hervey Bay whale watching tour didn’t initially go to plan. Our boat came in to engine trouble, we lost electrical power to one engine shutting it down which meant we sat idle for 90 minutes in the bay, just hanging out. 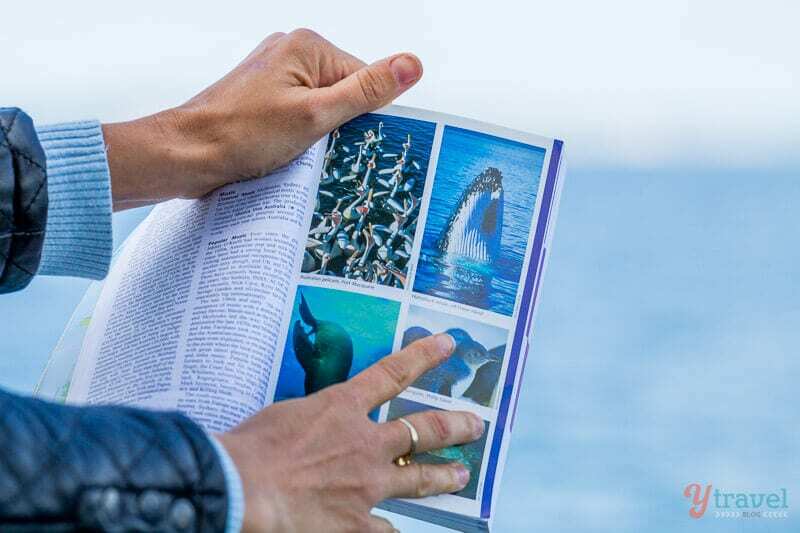 Teasingly, we could see some whales way off in the distance and for a moment we thought the only ones we would be seeing up close were those in our Lonely Planet guidebook. We used this time to take photos (including a few selfies) and enjoyed the rare moment of doing nothing, surrounded by glimpses of Fraser Island off in the distance. 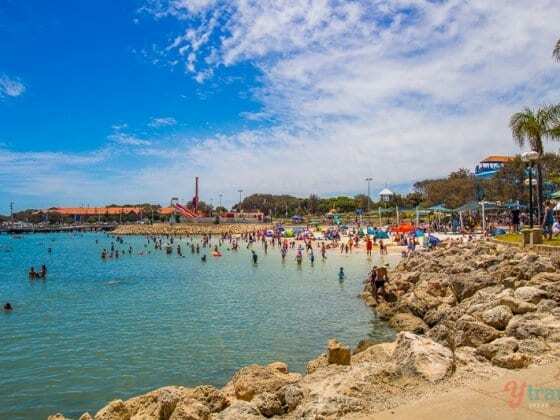 Whether you’re on safari in Africa or whale watching in Hervey Bay, these are wild animals we’re talking about living in the open and they come and go as they please. 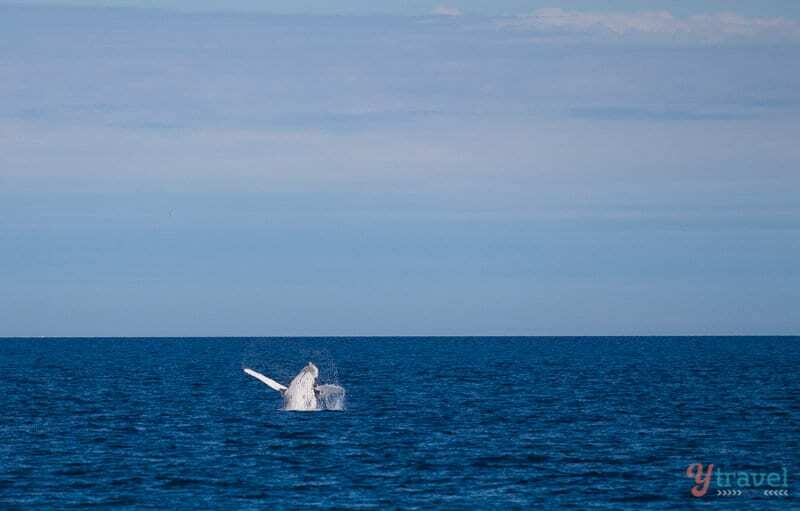 Captain Brian and crew did an excellent job of getting us going again and as soon as our boat was fixed, we sped off, quickly discovering why Hervey Bay is known as one of the best whale-watching areas in the world! We first saw them breaching from a distance and I quickly grabbed my camera and shot some pics on my 70-200 lens. The exciting thing is you never know when or where they are going to breach, and even if it’s not right next to your boat it’s still an incredible sight. 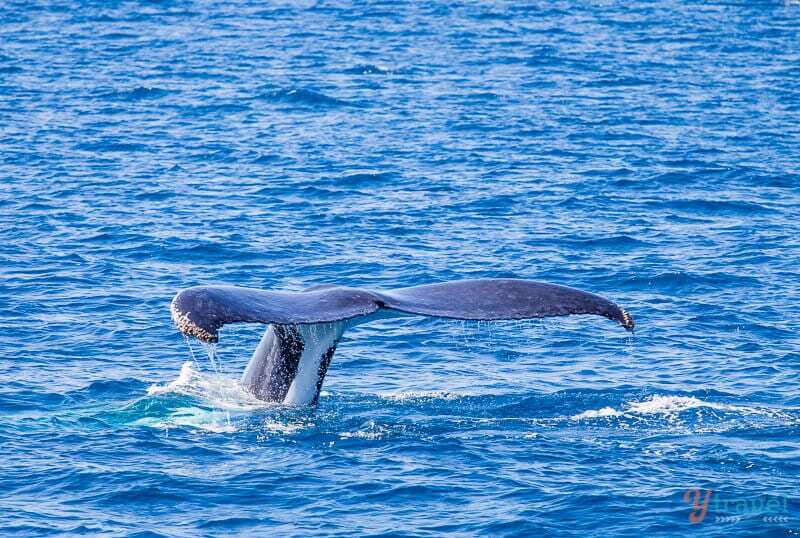 Hervey Bay whale watching at its finest! And then the day got better! The whales came to play right alongside our boat, waving hello with their tails and swimming right by. 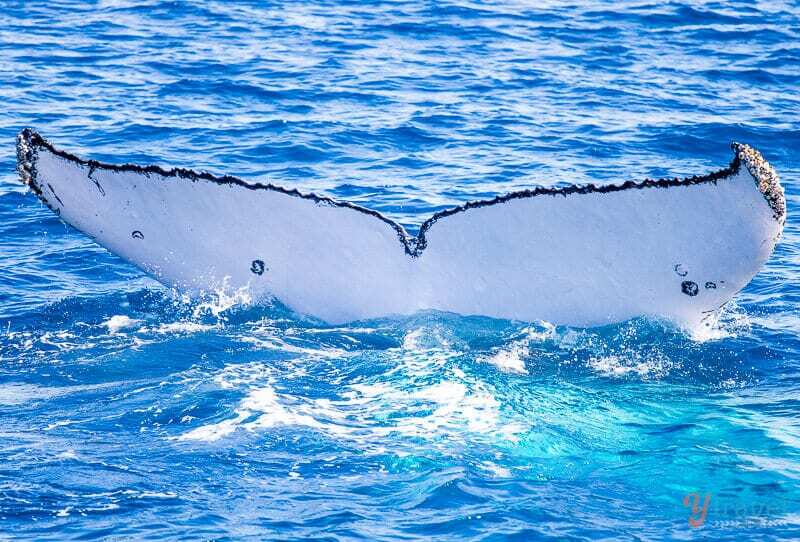 How’s this for a close up of a humpback whale’s tail? Our kids were, of course ecstatic! They are so majestic. Cruising around flicking their tail. Seeing the humpbacks up close in their element was like nature at its best. 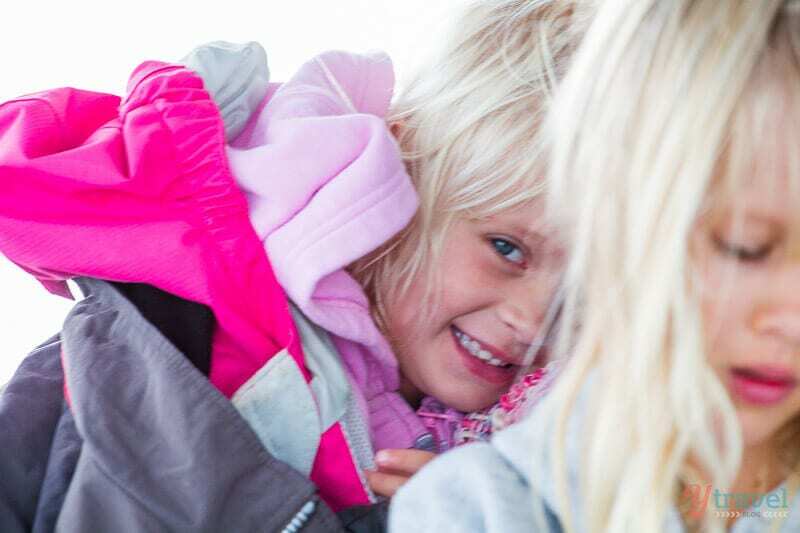 Needless to say, our return trip to the harbour was spent in quiet, gleeful wonder. 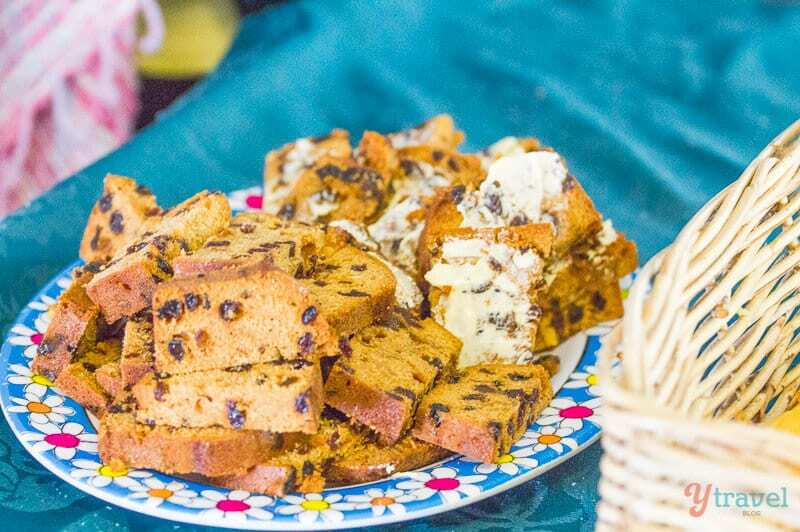 We shared photos with other passengers over more coffee, fresh fruit, toasties and fruit cake. 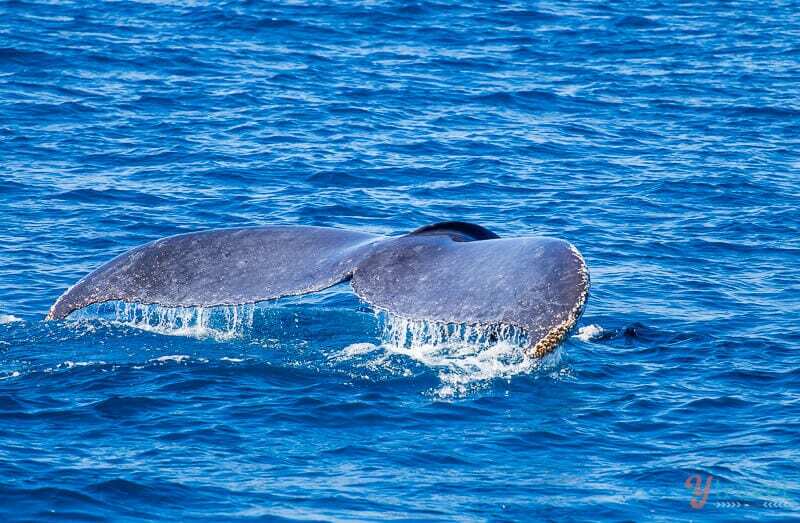 During whale watching season in Hervey Bay, there can be hundred’s of whales within the sanctuary on any given day. 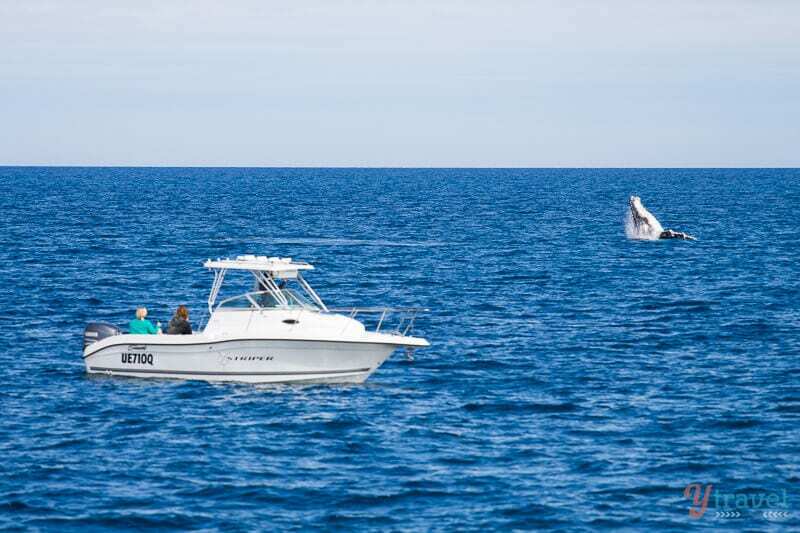 However, in the unlikely event you don’t encounter humpback whales on your tour, Hervey Bay whale watching allows each guest a further whale watching tour to use with no restrictions or give away to someone else. 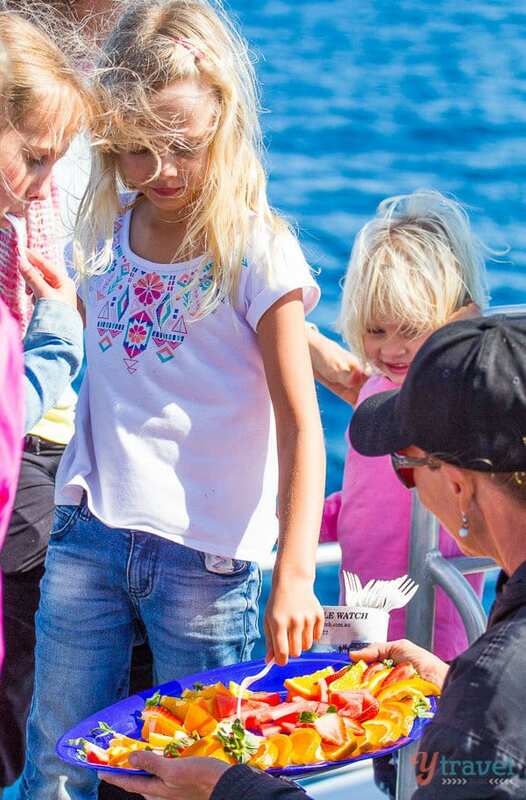 They were the first whale watching operators to offer this guarantee, almost 30 years ago. And being the great operator that they are, because our tour was delayed for 90 minutes, everyone on board was also offered this condition, even though we saw whales. I thought that was awesome! Tours last from 4 – 5 hours. We didn’t have long in the town itself, but here’s a few things we got up to. We arrived late Friday afternoon and took a gentle stroll along the Esplanade just before sunset. 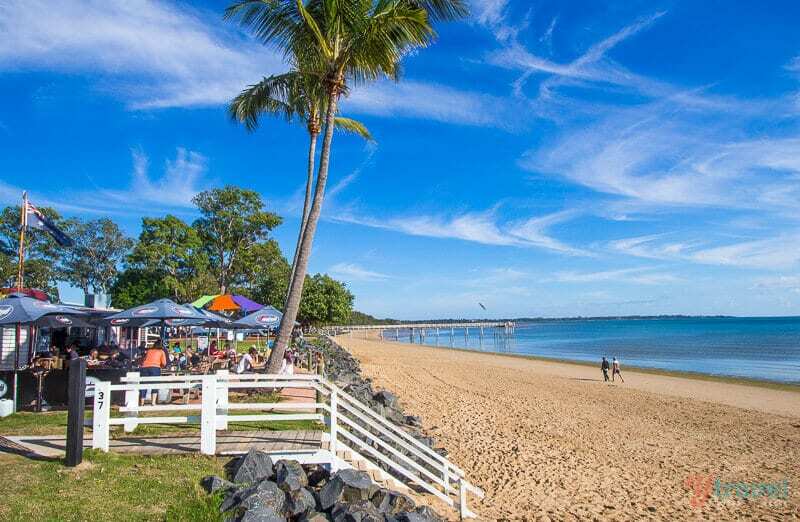 The 14km long shared pathway stretches all the way from the Urangan Harbour at the eastern end of the city to Gatakers Bay in the west, making it a great cycle path or long-walk. We did the section along Scarness Beach and enjoyed the sunset at the jetty. It’s also a great spot for BBQ’s and fishing off any one of the small jetties along the way. Taking a morning stroll at sunrise is best here at the Urangan Pier. This is where I took my sunrise photo before our whale watching tour. Just across the road from Urangun pier is a fish and chip shop, small, looks a bit dodgy even (no offense to owners), but it has THE BEST fish I’ve ever tasted. Only been twice with six years between visits and the quality was the same, melt in your mouth! Enzos on the Beach is a locals favourite cafe. 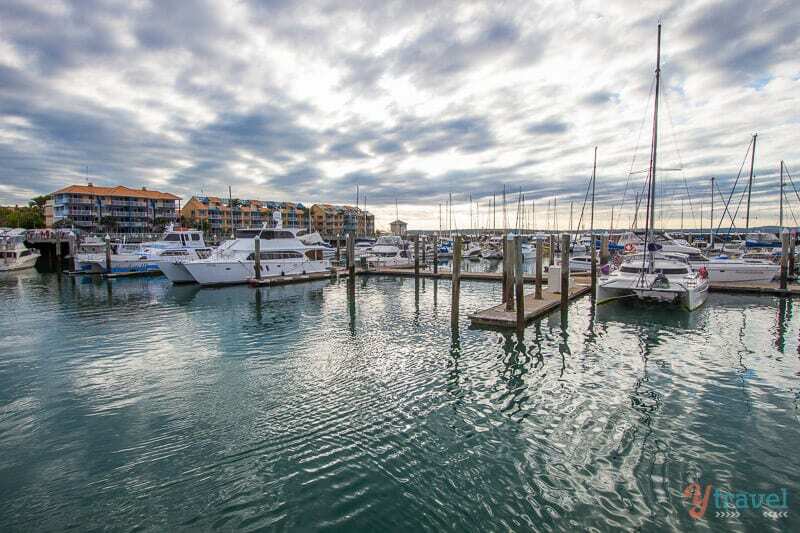 Step off the Esplanade and into the relaxed atmosphere of Enzos with uninterrupted ocean views of Hervey Bay and Fraser Island. The style is beachy, you’re right on Scarness Beach and set in a cute little cottage with a charming patio overlooking the sands. We loved the beanbags under the umbrellas and our kids enjoyed the playground next door that entertained them whilst we zoned out – winning again! Two other coffee houses recommended were Minimalist Coffee Roasters and Bean Beat Espresso Bar. We came to Eat at Dan and Stephs for some good coffee. We didn’t get to eat here though as we arrived after kitchen closed at 3pm. It’s popular, with Dan and Steph being the local celebs as previous winners of My Kitchen Rules in 2013, and you can expect to find some contemporary dishes. They work onsite, serving and cooking for their customers. Dan is famous for his sausages, and we also heard their Kadek Nasi Goreng (Indonesian fried rice with braised ham hock scotch egg and fried shallots) was one of their winning dishes on the TV show. 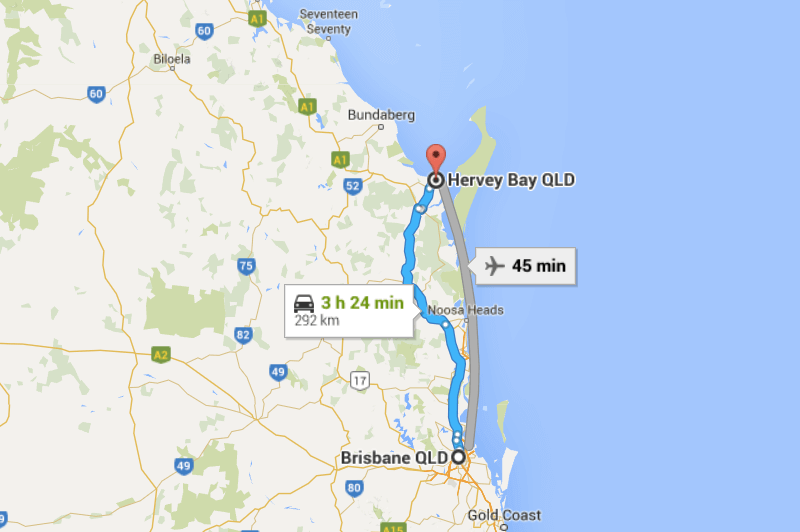 Hervey Bay is approximately a three and a half hour drive north of Brisbane, or a 45-minute flight. 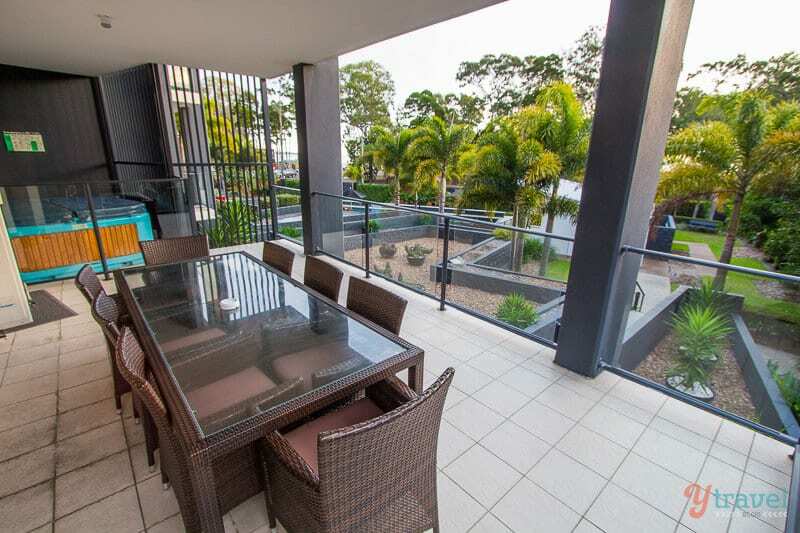 Our Hervey Bay accommodation was a lovely self-contained apartment, The Bay Apartments, which is right on the Esplanade with water views and if you don’t feel like cooking, your an easy walk to several restaurants and takeaway food outlets along the strip. You’re also within easy access to World Heritage Listed Fraser Island. Stay tuned, we have an article on Fraser coming up soon! Thanks to tourism Queensland for hosting our stay. For a complete list of things to do in the region visit their website. 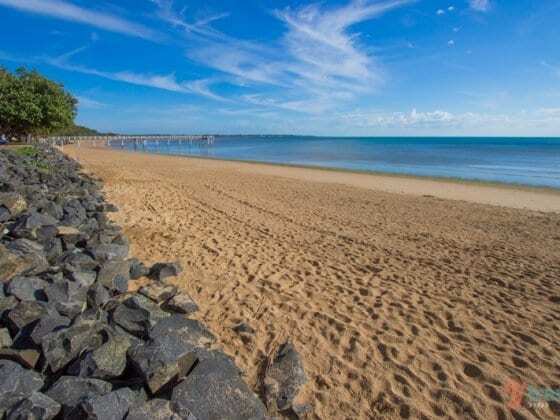 Booking.com has over 80 properties in Hervey Bay. You get free cancellation on most rooms and a best price guarantee. 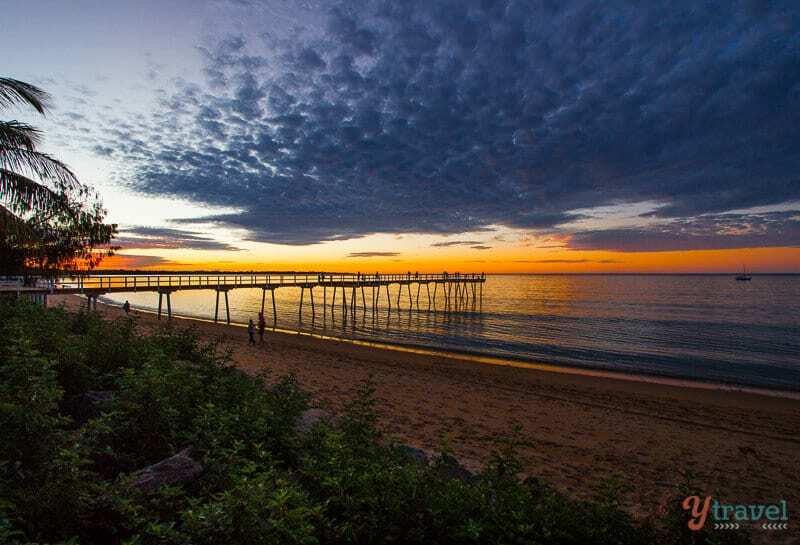 Check out these awesome tours in Hervey Bay with our partner Viator. 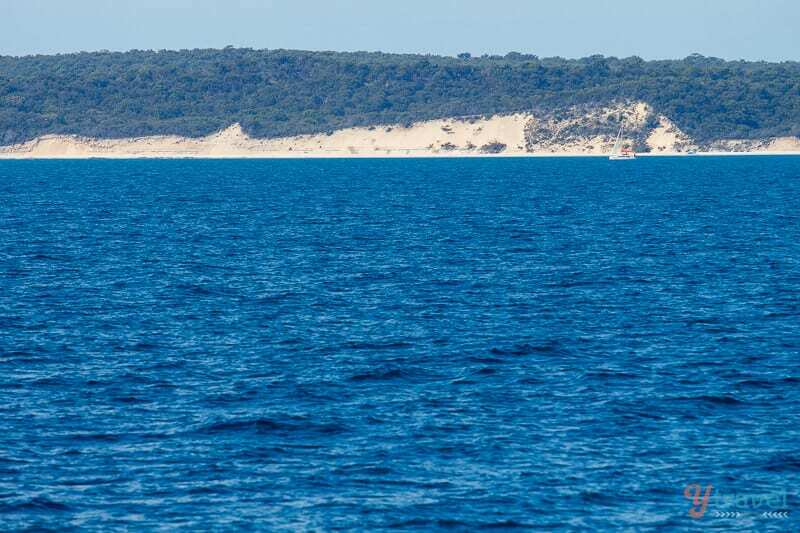 Have you been on any Hervey Bay whale watching tours? 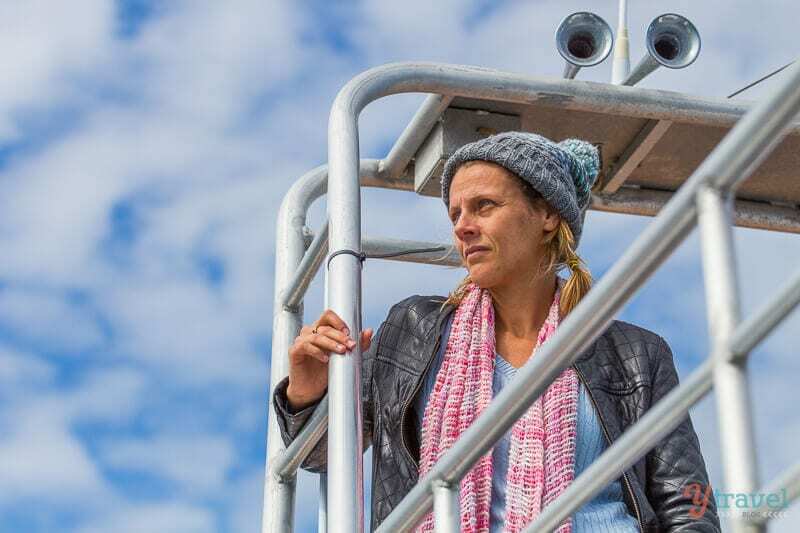 Did you spot any whales? What else did you do in town? Please share any tips in the comments below. Thanks James. Was a cool family experience. No way, I wanna see that! Hopefully one day I’ll visit the distant Australia or find something similar closer to Europe! I remember whale watching as a kid and being absolutely amazed at how huge and beautiful these creatures are. I’m sure your kids absolutely loved it!! 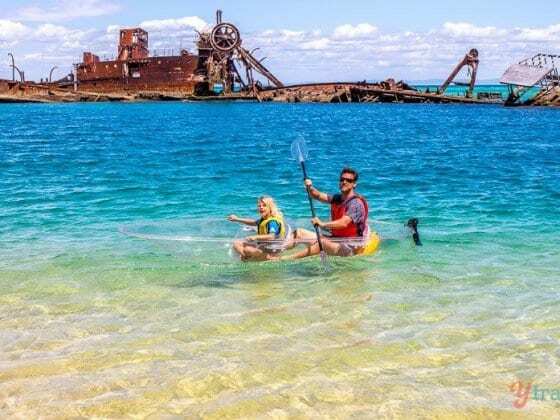 Yet another place to add to my Queensland bucket list 😛 Your blog is going to send me broke! We went whale watching the first time recently here in San Diego. We saw a decent amount but no breaches like yours, just some whale tail. We’ll have to go again to get shots like this!